Reading manager, Nigel Adkins, has not been afraid to let the youngsters have a path into the first team at any of his clubs over the years, and this season he continues to prove that. 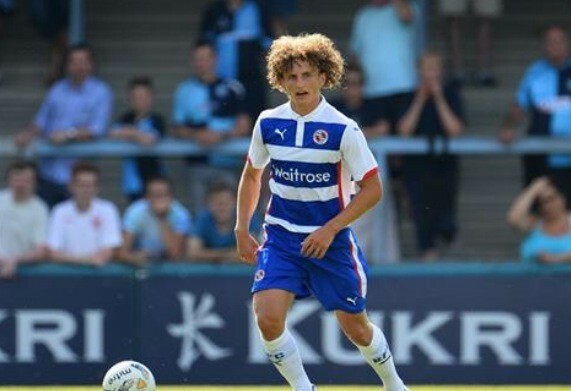 The latest young star to be handed his first team debut is Reading’s 18-year-old Central Midfielder, Aaron Kuhl. Aaron has risen up through the academy system at Reading, having joined the club in 2008. Aaron shone last season in a very successful campaign with the Under 21’s, who won the Premier League cup. We have been lucky enough to get the opportunity to speak to Aaron about his career so far. Give us a brief outline of your football history, from youth football to playing for the royals. Well, I joined the academy when I was 10. Then played through all the age groups. Then signed a 2-year scholarship. I won the U21’s cup as captain when I was a 2nd year scholar and now I have just started my first year as a professional. What is your favoured position? As a CM do you prefer to come and get the ball off the defence? are you more attacking? would you say you have goals in your game? Well I would say I am an all round midfield player. I like to get on the ball anywhere. I want to become a box to box midfield player being involved in everything from breaking up play and stopping goals to assisting and scoring goals. What players inspired you as you were growing up? Paul Scholes, Andrea Pirlo and my dad (Martin Kuhl) which is such a cliché, but he has helped me a lot. Can you tell me a little more about your dad’s impact on you as a player? and your development? He has had a massive impact on my game, I wouldn’t be the player/person I am today without him! He has basically coached me at every age group up to now, guiding me through the highs and lows, he always gave me advice on what to do in any situation as he’s been there and done it. He knows when to be hard on me and when not to. Also, he just knows how to get the best out of me. He’s just my role model, but not many sons say that their dad is their hero, but I’m one of those lucky ones who can say that mine is. Which player past or present would you most like to compare yourself to in a sense of their style and position? There isn’t one, but if I had to choose, David Luiz. Only cos we have the same hair and look freakishly alike! Would you say you have always wanted to be a footballer? I have always wanted to be a footballer, there is nothing else I could do, or would want to do! I love it. Who is the best player you’ve played with or against? Best I have played against is Ki Sung-Yeung (Swansea City). He acted like he had all the time in the world and was so calm on the ball. Best I have played with is Danny Guthrie. He just always seems to be a step ahead of everyone. He always knows where everyone is. I guess that’s what you get when you’ve played in the Champions League. Which player would you most like to play with or against in the future? There’s too many for me to say so here’s a few: Luca Modric, Steven Gerrard and Andrea Pirlo. Who is the best manager you’ve worked with? Nigel Adkins without a doubt, the depth him and his back room staff go into about every detail to make you improve is amazing! They try to help you in every way to become the best player you can become. Which manager would you most like to work with in the future? I would say Klopp because he shows the passion I like to see in a manager. He acts like he is playing the game as well as the players. He also seems to have a lot of humour about him. You’ve made a meteoric rise in the Reading squad following a very successful season with the Under 21’s. How does it feel to be representing Reading in the first team? And did you ever imagine you’d have this opportunity so early on? It hasn’t really sunk in yet because it’s happened so fast, and I’m very lucky to be in the position I’m in. But I’m just doing what I usually do and trying to impress the gaffer. At Reading, do you have any senior mentors? Have any players past or present helped you grow and develop? All the players are friendly and would never shy away from chat or if you ask for guidance. Also, when you have players who came through the academy who are now established 1st team members it helps as well. What is the highlight of your football career so far? Making my debut! Great experience and still can’t believe how quick it went. It felt like it lasted seconds! Was a great feeling but disappointed about the result of course! I can’t say anything else apart from how happy I am to have made my debut. What are your goals for the season, where do you hope to be with your career in the next few seasons? Just to keep doing what I’m doing and to keep working hard and to try to push into the 1st team to become a solid member. Would you say Nigel Adkins has made you, and other young players at the club, feel they have a route to the first team? Yes. He has the mentality that if you’re good enough and show the right mentality and attitude he will give you a chance. He believes in youth. We would like to thank Aaron and Reading FC for their cooperation with this interview with The Football Family. Ryan Nelsen to leave for America?